We, the below-signed organizations and businesses committed to the restoration of America’s Everglades and the protection of all of Florida’s water resources write to express our concerns and opposition to the use of Deep Injection Wells (DIWs) within the Lake Okeechobee Watershed as part of Everglades Restoration. The US Army Corps of Engineers (Corps) appropriately decided not to consider Deep Injection Wells (DIWs) as part of the Lake Okeechobee Watershed Project (LOWP), instead suggesting a regional study that would consider their system-wide Everglades impacts. However, in response to the Corps’ decision, the South Florida Water Management District (SFWMD) Governing Board voted on June 8, 2017, without any advance public notice or opportunity for meaningful stakeholder input, to go forward with a plan to develop DIWs to dispose of billions of gallons of fresh water and to cover the entire cost with public state tax dollars. · The use of DIWs is inconsistent with the goals of Everglades Restoration. DIWs are not a component of any project in the Comprehensive Everglades Restoration Plan (CERP). DIWs do not help restore the flow of clean water through the Everglades ecosystem. · DIWs would divert state dollars needed to implement other Everglades restoration projects, including the acquisition of land both north and south of Lake Okeechobee to restore wetland habitats and to eventually send clean water south to the Everglades, Biscayne Bay and Florida Bay. · DIWs in the LOW would permanently remove billions of gallons of freshwater from the regional water budget. Florida has faced drought conditions several times in the past few years and is likely to again and again. Once disposed of, the water would be unavailable for ecosystem protection and Everglades restoration during dry and drought conditions. This freshwater is also needed to replenish rivers, wetlands, and the aquifer for millions of Floridians, and to lessen the impacts from rising sea levels and fight saltwater intrusion that pollutes and shuts down potable water wells. · According to estimates presented by SFWMD in February 2017, implementation of DIWs would cost or exceed the cost of $1 billion dollars. Annual operation and maintenance costs will raise the actual budget for DIWs beyond SFWMD’s construction projections. That is a significant amount of public state funding diverted to a project that will offer no beneficial uses of water to people or the environment, particularly south of the Lake. · According to information presented during Project Delivery Team (PDT) meetings, there is relatively little geologic information in the LOW area. In fact, according to a 2007 desktop-study prepared for SFWMD, “the presence of appropriate hydrogeologic conditions for development of injection wells is less certain in areas north and immediately east of the Lake Okeechobee. Most of the areas considered for locating injection wells have little existing data regarding hydrogeologic conditions of the Boulder Zone or its confining layers. This report also states that “the transmissivity of the Boulder Zone is highly variable. It is related to the thickness and lateral extent of the cavernous zones and the related intensity of fracturing. In areas near the Lake, the transmissivity of the Oldsmar formation cannot be confidently estimated without testing.” It is very risky to depend on DIWs in this region; the state would be gambling taxpayer dollars on a project that may fail to provide its expected benefits. · There are valid concerns over vertical cross-contamination from upward migration of injected untreated water to the overlying Upper Floridan aquifer, especially given the uncertainties about the hydrogeology at this depth and location. The upward migration of DIW water can contaminate the Upper Floridan Aquifer which is being used as a source of potable water supply in many regional water supply utilities. 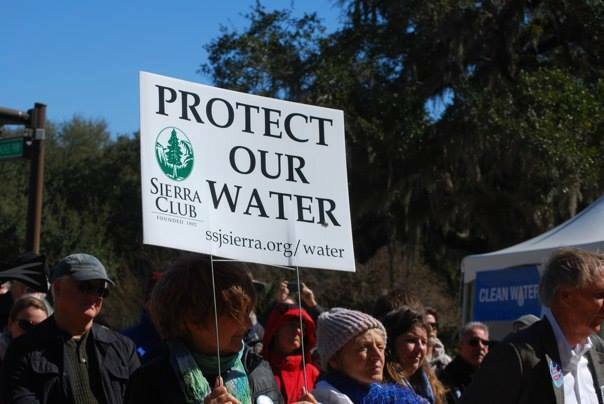 Groundwater contamination clean-up in the Upper Floridan would be cost-prohibitive. · Injected water from DIWs has been found to move laterally into the nearshore ocean reefs causing pollution and harmful algal blooms. Whether or not this might displace water that could create harmful seepage of ground water and fresh water into surrounding oceans has yet to be answered. · While DIWs (approximately 180) are currently being used to dispose of wastewater or wastewater byproducts in Florida, DIWs have never been implemented at the scale and density being considered by the SFWMD; nor have they been used to dispose of fresh surface water. The long term implication of disposing of such large amounts of untreated water into the Boulder Zone is unknown. · The disposal of freshwater from the surface ecosystem via DIWs will not help the natural carbon sequestration (capture) processes that come from protecting and restoring wetland habitats, such as mangroves. · The operation of DIWs will be energy-intensive, requiring pumps that run on fossil fuels to pump millions of gallons of water per day, per well, for an unpredictable number of days to months per year. This operation would increase the release of carbon into the atmosphere from the burning of fossil fuels. The best solution to significantly reduce and ultimately eliminate harmful discharges from Lake Okeechobee to the northern estuaries during extreme weather events is to speed up the long term restoration of the Everglades ecosystem. We urge you to ensure that public state tax dollars are invested in Everglades restoration projects that are fully vetted, are consistent with CERP, do not jeopardize our public drinking water supply, and do not waste the state’s precious fresh water resources. Friends of Warm Mineral Springs, Inc.
Withlacoochee Aquatic Restoration (W.A.R. ), Inc.
WE CAN U & ME, Inc.